Happy Monday! I thought I would take a bit of a different approach to talk about arthritis today. 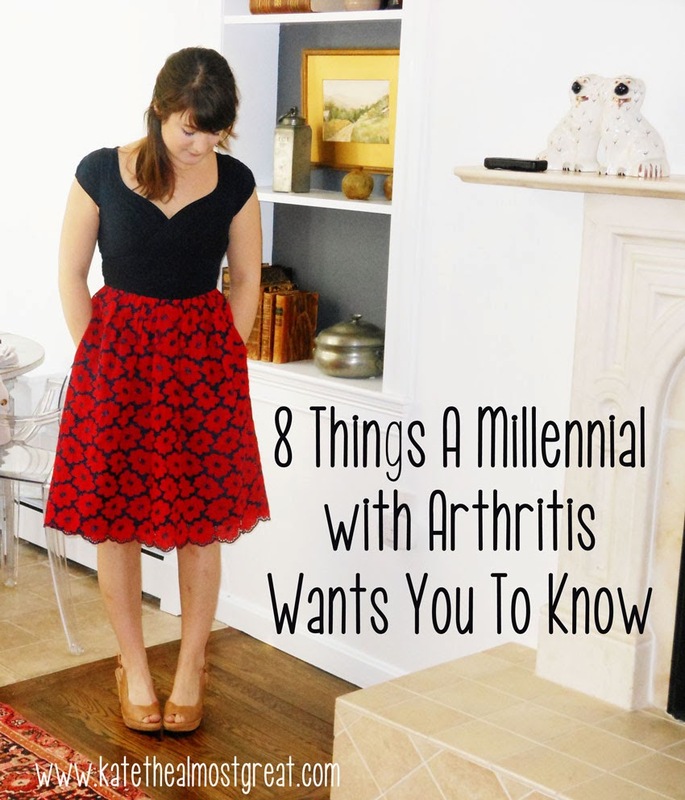 Here are 8 things I, a millennial with arthritis, want to tell you! 1. I’m not “too young” to deal with this. When someone says to me, “But you’re so young!” I’m assuming that they mean, “It’s too bad that you have to deal with chronic pain when your bigger life problems should be about finding a job and maybe a relationship since you’re 23.” But there is a better way to express it, especially since there are 300,000 kids out there with juvenile arthritis. Arthritis doesn’t discriminate! 2. I’m not trying to get out of things. Sometimes I feel a little paranoid that internally people are rolling their eyes and going, “Sure, she totally isn’t up for going to this event. But she could go to that event, so she’s fine.” If only it worked like that! But it doesn’t. Similarly, I do actually need to sit instead of stand, board planes early, use a cane sometimes, etc. Not faking just because you can’t see it – remember the parking lot incident with my disabled placard? 3. I can still accomplish a lot and be a productive member of society. Thank goodness for technology, am I right? I can keep in touch with friends, contribute to society, write, publish, advocate, work, and more all from my bed. So while I may not be able to work in the conventional sense of 40-hour week at an office, I can still earn money and give back to the community. 4. Not every day is the same; some are good and some are bad. And even the in-between days vary! Some times I gauge how I’m feeling based on whether I’m able to leave the house, if I’m up to wearing makeup, what types of clothes I’m wearing, when I need to take pain medication … it’s never the same. 5. No two patients are the same, although we may have similarities. So just because you know one person with arthritis doesn’t mean that you know everything that a patient goes through. There are some who have arthritis but you would never know because it is mildly active or in remission. There are others who need intense sessions of chemotherapy, surgeries, and are disabled. We run the gamut! 6. Arthritis is an autoimmune disease. I have two points to this. One is that while natural methods may help ease some symptoms, overall a natural treatment will not completely heal us. We can do everything possible in our daily lives to decrease what aggravates the immune system – like eating anti-inflammatory foods or not eating inflammatory foods – but there is no way to stop arthritis. 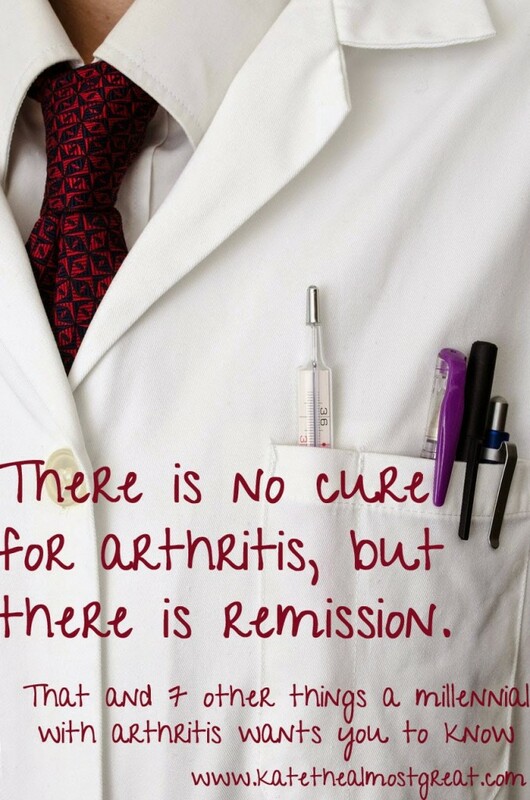 Cases of remission with arthritis without treatment are not common. That’s why medications are so important; they suppress the immune system so that it can’t attack. That brings me to my other point: the immune system is suppressed. Therefore, it it significantly easier for us to get sick, and it is much harder to recover from illness. Routine health problems that other people may dislike but don’t seriously worry about can be deadly for us. There are approximately 36,000 deaths and 200,000 more are hospitalized in the United States every year from the flu – and every year I worry that I may be one of them. That’s why it’s especially important for you to get the flu shot if you can: your immunity protects you as well as those around you who have a higher chance of serious illness. Story time! In college, I was a part of the concert choir and we went on tour every year during spring break. When you have 50 people traveling and staying together in close quarters for 5 days without much sleep, illness spreads easily. I caught the cold that went around, except for me it turned into bronchitis. Tour ended on Thursday in D. C., I flew to Boston, and my dad took me to urgent care before my rheumatology appointment according to my rheumatologist’s instructions. 7. There is no cure for arthritis, although there is remission. Remission means that symptoms nearly disappear without the disease itself being entirely gone. The majority of patients (75-80%) live without regular periods of remission, which can be months or years depending on the patient. (source) We live with the knowledge that our future will have arthritis in it to some extent. 8. We are not drug seekers. Now, this isn’t to say that there has never been or never will be an arthritis patient who becomes addicted to their medication, as that’s just a naive thought. However, there are many arthritis patients who legitimately need pain medication. Their already difficult lives become even worse if the process to get their medication is nearly impossible and/or people at every turn treat them like drug addicts. Imagine this: you have joint damage that causes you high pain and you’re trying to live a normal life. In order to do this without running to the ER for extreme pain at least once a month, you and your doctor agree that a prescription for Lortab (a combination of hydrocodone and acetaminophen, the leading ingredient in Tylenol) is necessary. According to law, there are no refills for the prescription and you need to go to your doctor’s office to pick it up in person every time you need a new one. You take your prescription to the pharmacy nearby, and as soon as they see what it’s for they start treating you differently. The pharmacists are a little rude and eye you suspiciously. When they go to check their storage, they discover that they are out of Lortab and it will take a couple of days to get it in. But your arthritis doesn’t care what their supply looks like. They make some calls and it turns out that there is only one pharmacy in the area who has some in stock. You trek over there, tired and in pain, to be treated rudely and suspiciously as well. By the time you have your prescription, you are emotionally and physically drained. This is what I go through every month – and it could be much worse. In some states, the number of people who can prescribe pain medication is extremely limited. In trying to prevent harming others through addiction, the law hurts people like me who are not addicted and have very legitimate reasons for needing the medication. The cartilage under my kneecap has come apart from the kneecap and I can’t have surgery for it until one month from today (THANK GOODNESS) because my immune system is suppressed and my risk of infection from surgery is incredibly high. I have been walking around on my extremely injured knee for years. Last year, I dislocated my knee at least 3 times and was able to avoid the hospital twice because I could relocate my knee myself and had the medication I needed. This saved me thousands of dollars. 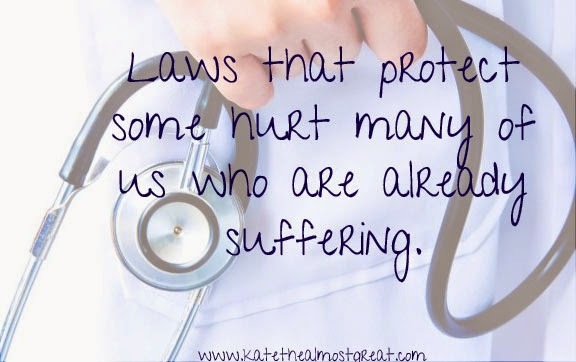 And yet I am treated poorly by the law, pharmacists, and my fellow people as a whole. Did any of these points surprise you? 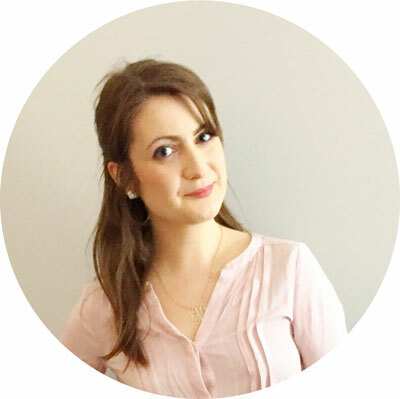 To my fellow arthritis patients, what would you want to tell others? EDIT: Thank you for the tremendous response to this post! I ended up expanding on the ideas in this and discussing life with chronic pain in more detail specifically focusing on the other ways it affects life than just the pain. You can find that here.